Big or little jobs, the 2017 Chevrolet Silverado 1500 is the truck to take on them all. You can choose the exact configuration to suit everyday needs, including a short, standard or long bed, plus a regular, double or crew cab. Further customize the pickup with different powertrain components and other systems designed to keep up with any task. Plenty of interior amenities can be added as well, providing for your every comfort along the way. You get more choices when it comes to engines. The first is a 4.3-liter EcoTec3 V-6, which can run using unleaded gasoline or up to 85 percent ethanol blend. Active fuel management, direct injection and variable valve timing help make the most out of every gallon of gas. With 285 horsepower and 305 lb.-ft. of torque on tap, you have plenty of capability for hauling and towing. A 5.3-liter EcoTec3 V-8 is also available, endowing the 2017 Chevrolet Silverado 1500 with more capability. It's rated at a stout 355 horsepower and 383 lb.-ft. of torque and makes use of the same fuel-saving technologies. Maximum performance comes via a 6.2-liter EcoTec3 V-8 engine, which features a highly durable aluminum block. Pressing on the accelerator brings to life a maximum 420 horsepower and 460 lb.-ft. of torque. Each version of the 2017 Chevrolet Silverado 1500 comes equipped with a six-speed automatic transmission, regardless of the engine. An included tow/haul mode helps with acceleration and braking when dealing with heavier weights. Powertrain grade braking works automatically, avoiding brake fade by using the engine and transmission to slow down the truck when going down steep hills. Rear-wheel drive is also the standard setup with the 2017 Chevrolet Silverado, but four-wheel drive can be added to any model. A floor-mounted shifter is included for the transfer case, making it easy to shift between two-wheel drive high, four-wheel drive high and four-wheel drive low. Hill descent control is included on certain models, but Stabilitrak with hill start assist and trailer sway control is standard across the board. 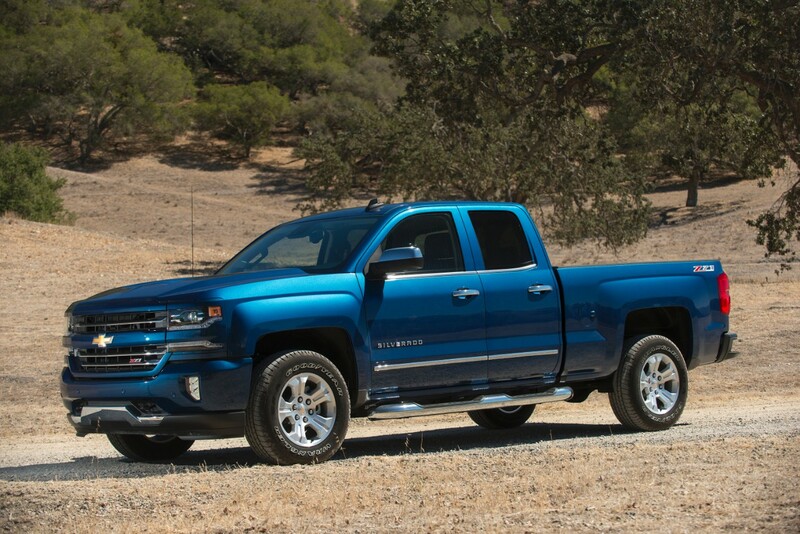 As a truck built to tow, the 2017 Chevrolet Silverado 1500 can be outfitted to take on some sizable trailers. An optional Max Trailering package boosts towing capacity to an amazing 12,500 pounds, making the pickup a leader in its class. You can get an integrated brake controller and a rearview camera, which makes connecting the truck to a trailer far easier. Four-wheel antilock disc brakes with DuraLife rotors also help with longevity, even when routinely stopping the added weight. Feel confident with the 2017 Chevrolet Silverado 1500, thanks to front, seat-mounted side and side-curtain airbags, daytime running lamps and other standard features designed to keep everyone safe. You can add advanced safety technologies such as lane keep assist, forward collision alert and low speed forward automatic braking. The cabin also feels serene with premium materials, including available soft leather upholstery and wood trim, plus sound-insulating features such as triple-sealed inlaid doors. An available Chevrolet MyLink infotainment system, USB ports, navigation and 4G LTE WiFi let you stay connected virtually anywhere you go.